Toy launches, art exhibits, Chinese New Year banquets and more in this edition of our family weekender guide. 1. Watch a feel-good play. This January 20 to 22, catch the staging of the Broadway show "Love, Loss, and What I Wore" at the Carlos P. Romulo Auditorium, RCBC Plaza, along Ayala Avenue in Makati. Shows are every 3:30 p.m. 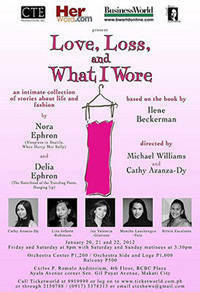 The play is about the different stories of women and what they were wearing during critical moments in their lives. Tickets cost P1,200 for orchestra center, P1,000 for orchestra side, and P500 for balcony. For ticket inquiries, call 891-9999. 2. Go on an art appreciation spree. Check out Roberto Chabet’s “To Be Continued” exhibit at the Main Gallery of the Cultural Center of the Philippines, until March 31, 2012. Works featured celebrate Chabet’s 50 years of work in the field of art. For more information, call 832-1125 to 39 or visit www.kingkongartprojects.org.